My moods are swinging more than a child on a playground. In the same breath, in no particular order, I will cry, laugh hysterically and scream. The book, “What to Expect When You’re Expecting,” says women experience extreme mood swings in the third trimester, and our partners are going to have to have a little extra patience… I think everyone I encounter needs to have a little extra patience, especially as my husband is away four days of the working week. How much more can pregnancy throw at me in the next few weeks?? Ok that’s a rhetorical question. I am so mentally drained right now, I don’t know how I feel anymore and the only really understanding person is my midwife. 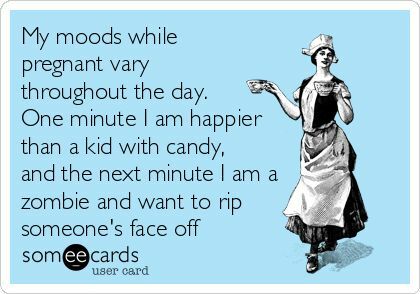 I so want to just smile all the time then the crazy lady pregnancy hormones kick in and I find myself scowling and ranting about something or get the feeling of just wanting to cry. But here is the crazy part, I just don’t care. Just like my husband has been run over by the pregnancy moods, so have I. I just keep telling myself that there are only a few more weeks to go and I should just relax and enjoy the rest of this pregnancy as much as possible.